Is any business safe surviving on “the old”? Managing a product or service that is in decline requires skill. Companies that do it well can use the cash to fund investment in other areas and to support their long term vision. I’ve spent a large portion of my working life in the print industry with declining product sets. The business of print is, and has been, a good business to run. But all products run the full life-cycle. Continuing to focusing on getting more efficient at a specific product or service is like a race to zero when competition is factored in the equation. At some point the financial margins have been squeezed and re-squeezed to a point that it becomes difficult to sustain and support the business for future growth. How is long term thinking connected to now? One of the principles of the Toyota Production System (TPS) is to base management decisions on a long term philosophy. That’s easy to agree with, but more difficult to focus on in a business environment that demands quarterly results to shareholders. I’ve had a hard time seeing this principle supported over the years. Just how do I connect long term thinking to the here-and-now? Inspiration comes when you aren’t looking for it. This week I had lunch with a few colleagues and the conversation drifted to automobiles. Everyone at the table had a story about a car that was impactful to their lives. Each of our stories shared a common theme; each of us placed the most value on the vehicle that was reliable, required the least maintenance, and lasted well beyond any loan payments. As I reflected on it later, I realized that no one spoke about add-on features, engine sizes, or even gas mileage. The most important thing was reliability, predictability, and service. These are all characteristics of transportation that transcend the offering of an individual vehicle. So I asked myself, what are the characteristics of my business and workgroup that transcend an individual goal or project? What are those characteristics that define an ability to create new and adapt the old with the changing conditions of the business? How can I think long term in the now? Investing in people at work is a long term commitment for both the relationship and the value the employee brings to the organization. When I stress the importance of a weekly one-on-one meeting it is intended to coach, mature, and grow the individual in the values of the company. When I make an objective for employees to seek continuing education, it is an investment in the long term skills of the employee and their ability to contribute to the company in the future. Make long term goals part of the annual goals and objectives process. Sometimes these goals are a continuation of key metrics for more efficient processing. Sometimes these goals are to expand into new markets, launch new products, or improve efficiencies. 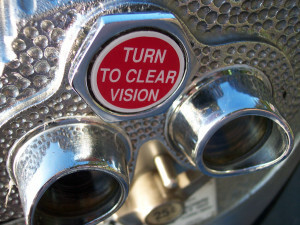 The point is to make sure the goals align with the long term vision of the organization. This links to my current day activities because the work that I’m doing to satisfy an individual goal should support the long term vision. The work is a building block in moving the organization toward a future goal. Another principle of TPS is that the right process will produce the right results. I know personally, I don’t accomplish every goal and objective I set for myself or group. But if the goal is aligned to the long term vision, then it shouldn’t be abandoned. Long term thinking ‘in the now’ means I should stay persistent to win the day. I should work through setbacks by rethinking my approach. Those are three characteristics for long term focus that I see in my day-to-day. How do you push long term thinking into your everyday routine?